California’s coolest and trendiest weekend getaway is somewhere a little off the radar, but so worth it. Located just one hour Northeast of Palm Springs lies Joshua Tree, a national park filled with the trendy succulents that give the park its name. Aside from the National Park, travelers retreat to Joshua Tree for a more relaxed and authentic retreat to the desert, one where festivals and crowds are traded for pioneer vibes and time spent with a good book. Check out this weekend getaway guide to Joshua Tree for the ultimate 2-day retreat in the desert! Acido Dorado – Acido Dorado is an architectural masterpiece. This house was created by renowned architect Robert Stone and featured on many magazines! While the cost per night is a tad expensive, think of this place as your desert party pad. Impress your friends with your “weekend getaway” covered in ornate gold. Joshua Tree Adobe House – Tucked away in the hushed wilderness of the Joshua Tree Highlands lies the Adobe House. This renovated house has two master bedrooms, a spacious living room and an incredible outdoor tub. The best part? The panoramic views that take place at sunset and sunrise! Rosa Muerta – Another Robert Stone masterpiece. This darker and seducing home is similar in style to Acido Dorado and a lot less expensive! The modern style home has an outdoor living room, spa and fire pit. Make this gothic, modern home your next party scene or just a place to enjoy some interesting architecture. The Joshua Tree House – This 1949 Hacienda home is located close to the Joshua Tree National Park, making it a perfect spot for you hikers and outdoorsy types. Along with amazing views and Wild West-inspired decor, you will find an amazing jacuzzi that brings cosmic views at night. Dome in the Desert – Looking for an alternative way to relax in the desert? This dome house is a lot more cozy and a lot more affordable! Like a cabin in the woods, this dome features a natural wood burning stove, boho decor and an amazing location! But don’t expect to zone out in front of the TV as this is one thing you won’t find in the cozy dome. The Natural Sisters Cafe – This cafe is a staple for all things healthy and good for you. Here, you can find amazing vegan and vegetarian options as well as some amazing, nutritional extras like bee pollen, wheat grass and hemp protein powder. Crossroads Cafe – Looking for a real hearty breakfast? Crossroads is a locals favorite for American-style breakfast. Here you can find amazing hotcakes, huevos rancheros, burgers and a few tasty options for vegans! Pie for the People – Sometimes, you just wanna stuff your face with fat food and Pie for the People is the ultimate pizza spot for you foodies. With slices like the David Bowie and Johnny Popper, you’ll find that this pizza place is unlike any other found in SoCal. Pappy & Harriet’s – This is the true heart of Joshua Tree. “Pioneer Palace” as it’s lovingly called is THE SPOT for all things music and BBQ. It’s a quaint and quiet spot, with only one grill for the entire restaurant. But what it lacks in space, it makes up for in entertainment! Joshua Tree Coffee Company – Quite possibly the best java in town! Joshua Tree Coffee Company is a coffee lover’s dream with fresh, organic coffee and their cold brew Nitro coffee is on another level! Antiquing and Thrifting – If you’re looking for real gems you can’t find anywhere else, you have to go antiquing in Joshua Tree! Find Mexican blankets, mid-century collectibles, figurative sculptures, and folk art at multiple shop stops like Starlite Courtyard, Hoof and the Horn and Pioneer Crossing! Rock Climb – Joshua Tree is the ultimate spot for rock climbers! With more than 400 climbing formations and 8,000 climbing routes, Joshua Tree has challenging climbs for all levels. Make sure to check out the Joshua Tree Rock Climbing School for training and more information! Discover Pioneertown – 15 minutes from Joshua Tree is Pioneertown, a high desert community of Yucca Valley built in 1946. The town was originally created by a group of actors who envisioned a live-in motion picture set and developed the town for actors and crew. Now Pioneertown is now a unique experience for guests, especially those who love music, beer and enjoy line dancing. Enjoy Joshua Tree’s Art Scene – From the 29 Palms to JTAG to Gallery 62, you’ll find a ton of amazing artwork in Joshua Tree. The galleries feature artists both local and foreign to provide a wide range of exquisite pieces for your viewing pleasure. 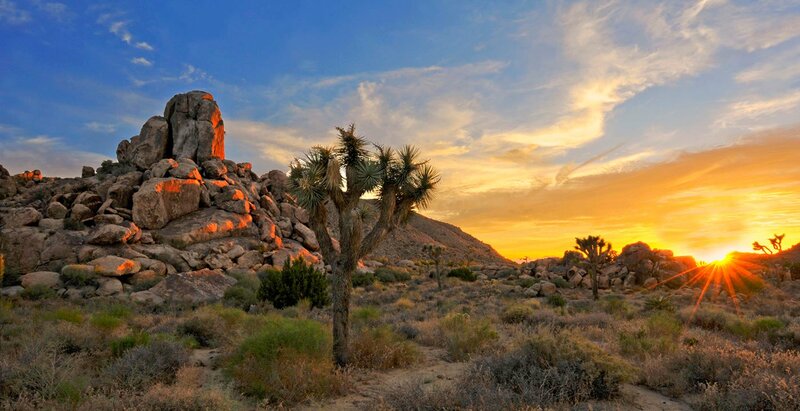 Explore Joshua Tree National Park – From Hidden Valley to Skull Rock to Ryan Mountain, there’s plenty to see at the Joshua Tree National Park! This National Park hosts a ton of events, but is great for nature lovers! Check out the Integratron – Interested in the paranormal and unexplainable? Believe in aliens and UFOs? Check out the Integratron, a structure built by UFologist George Van Tassel. Van Tassel claims his building is capable of rejuvenation, anti-gravity and time travel. Carey’s Castle – If you’re up for a hiking challenge, this is the ultimate trek for you! Hikers say they get lost along the way so make sure to bring a map and prepare for this outing. But once you find Carey’s Castle, this once very secret, local spot, you’ll find genuine historical relics and Native American cave paintings!